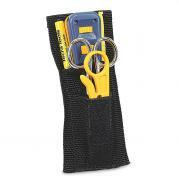 Detailed listing of our belt pouch tool kits. Instant access to the tools you use the most - right on your belt! Our Telecom Pouch Kit includes the Fluke Punchdown Tool with 66-type and 110-type punchdown blades, Slotted/Phillips screwdriver, electrician's scissors, spudger, UTP cable stripper and Cordura belt pouch for easy access to your tools. Compact telecom cable splicing kit features US-Made Snips and Splicing Knife for years of reliable service, all in a durable leather belt pouch. 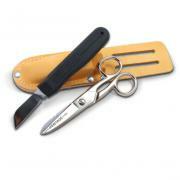 Professional quality fixed handle cable splicing knife and multi-purpose electrician's scissor set in a leather, heavy duty belt tool pouch. 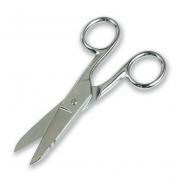 The included electrician's snips feature a smooth cutting blade and stripping notches. Forged of cutlery steel, double plated, multi-purpose Electrician/'s Scissor for medium gauge wires, insulation materials, and harness ties. 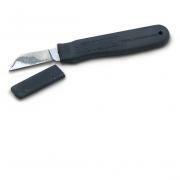 For added convenience there is a scraper and a file forged into the sharp steel blades. Made in USA. Handy, lightweight cable splicing knife features tough, coping style forged steel blade and full size, high dielectric handle.